My IUCN status: Near threatened. The only reason we have these for sale is that they were imported before 1970 to the U.S., after which time the U.S. does not import them from Canada. We can only ship them within the United States. It is one of the rarest animals in the ocean. The narwhal is known for its distinct tusk, which landed it the nickname “unicorn of the sea.” But the “tusk” is actually a tooth! The teeth are very sensitive, and have up to 10 million nerve endings inside each one. All are born with two teeth, but they change as we get older. Males usually have one tooth that becomes much more prominent than the other, where females typically lose their teeth. The tooth can grow up to 9 feet long! Sometimes a double tooth grows permanently. I’m a porpoise and am related to orcas, harbor porpoises and bottlenose dolphins. Porpoises like us travel in groups called pods. Narwhal pods are usually made up of anywhere from 10 to 100 individuals but sometimes our pods can number almost a thousand. My closest relative is the beluga whale, here is a photo of both the beluga and the narwhal. Where they like to hang out: in the frigid cold waters in and around the Arctic. Where they live: Unlike other whale species that migrate from the Arctic in the winter, they spend the whole year in the circumpolar Arctic waters of Canada, Greenland and Russia. The narwhal was one of the many species originally described by Linnaeus in his Systema Naturae. Its name is derived from the Old Norse word nár, meaning "corpse", in reference to the animal's greyish, mottled pigmentation, like that of a drowned sailor, and its summer-time habit of lying still at or near the surface of the sea (called "logging"). The scientific name, Monodon monoceros, is derived from the Greek: "one-tooth one-horn"
Genuine vintage LARGE NARWHAL TUSK, came from an estate that had owned it for many years, estimated age 60+ years old. 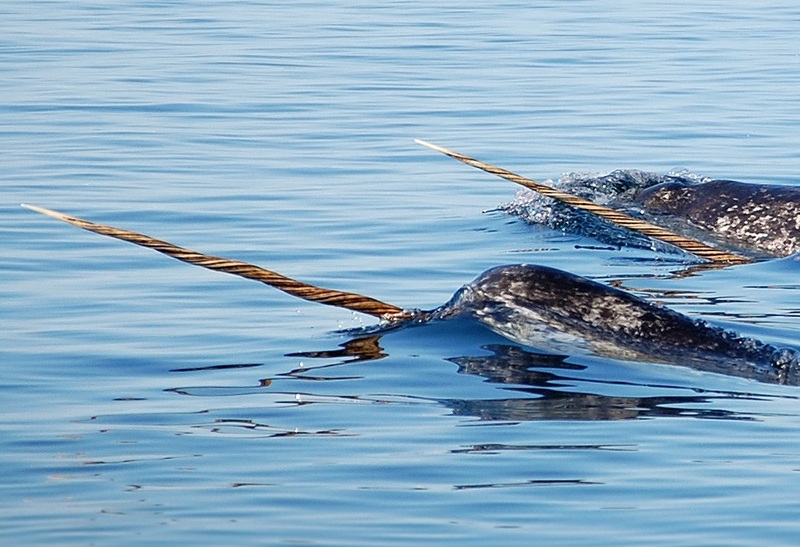 Called "the unicorn of the sea", male narwhals generally have one tooth on the left side of its head that grows out as a tusk (rarely double tusks but possible). This is considered a LARGE tusk, beautiful, heavy and undamaged. A rare legal acquisition within the United States, and can only ship within the U.S.
Genuine vintage SMALL NARWHAL TUSK, came from an estate that had owned it for many years, estimated age 60+ years old. Called "the unicorn of the sea", male narwhals generally have one tooth on the left side of its head that grows out as a tusk (rarely double tusks but possible). Considered a SMALL tusk. The tip had been broken off and stored in the hollow end. We have reattached it to the end so it is now complete. A rare and legal acquisition within the United States, and can only ship within the U.S. Measures 47-1/4" long x 1-9/16" diameter. Wood Victorian style Base (included) measures 12” wide at floor x 12” tall.